Ladeej, Jents and Sreesanth, we bring you this bulletin in times of grave sorrow in the avian world. This is Munna Mobile reporting from the lawns outside the Ministry of Environment and Forests(MoEF) where after copious amounts of filter coffee and ribbon pakodas, grim faces have emerged from an all staff meeting. There has been a surge in the number of dead birds falling from the sky in many parts of the world and now all eyes are on India. This weird and highly unfortunate phenomenon has puzzled scientists, bird watchers all over the world, for there seems to be no common thread that runs across all the incidents. Fireworks, electric cables, pollution, and carcinogenic airwaves as a result of Arnab Goswami’s daily outburst have been cited as the most likely causes. After dillydallying over a dozen other possible causes, the worlds brightest minds have decided that the solution lies in Hindu Mythology. Afterall most solutions to problems in the western world can either be solved by picking up the phone and talking to Maggie alias Mythili alias Maragadhavalli with a horrible accent, or Sr.Software Engineers with Database ERP & Software responsibilities. There is a third kind wherein you go to Bikram Yoga, buy carpets, light incense sticks, play hypnotic chants and leaf through the pages of the Kamasutra. The collective knowledge of all the scientific brains in the western world has agreed that this time the solution lies in the great Indian Epic, The Ramayana! mortgaging propertiesled simple lives as stockbrokers, maxing out credit cards, and mortgaging properties. One day streethawk spotted a golden yellow Lamborghini speed by and instantaneously wanted to own one even if it meant having to pawn the mercs they had. After being nagged for for what seemed like eternity, Lore-Drama finally relented and set out to stand in line outside the dealership. Before he left, he left Larks-man at home to ensure that Streethawk was always confined to the walls of the mansion. After a while, streethawk heared a cry of debt-ridden home-owner chased by deranged collecting agents. Suspecting that to be of Lore-Drama’s she nagged Larks-Man to find the source and see if it was indeed his brothers. Larks-Man confiscated all of Streethawks credit cards and set out to seek the source of the cry. This enabled Rowan, an investment banker to gain access to the mansion and sweet talk the housewife. Not paying heed to Larks-mans warning of resisting purchases, Streethawk signed the dotted line to a timeshare on an island in the Indian ocean without reading the fine-print. Rowan seized the opportunity to abduct Streethawk in his Cessna and make their way to the emerald island. En-route a giant vulture named Jet-air-you answered the cries of Streethawk and swooped down to attack the airplane. Rowan hacked the wings of the great bird and it fell to the ground after putting up a brave fight. Before dying, the fallen bird signaled Lore-Drama to extract the DNA of Rowan from its wings and the rest is history! Ok I apologize for the #mudballs in the above paragraph, got carried away a bit. 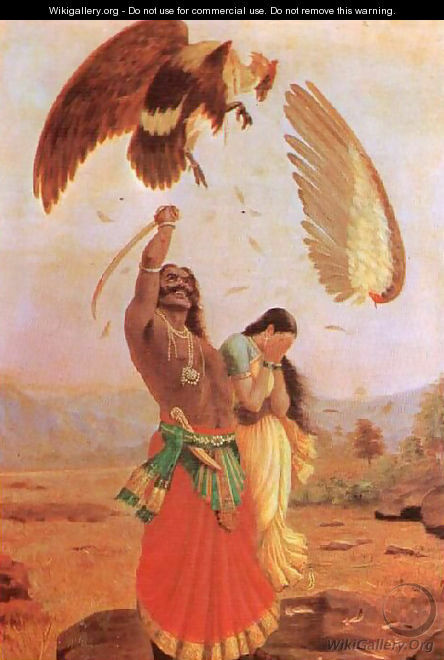 Jatayu fought bravely but fell to the blades of Raavana, and attained moksha after passing on the info to Rama. That resulted in the war on Lanka and the eventual destruction of Raavana. While the world rejoiced and celebrated the victory of good over evil, the descendants of Raavana were ever ridiculed and swore to avenge this betrayal by the avian world. Ever since a secret society has carried on this war against the avian world and go about launching attack and mass slaughters. The Brotherhood of Raavana’s Army(BRA) has it’s branches all over the world and the brothers make an unbreakable vow to rid the world of these flying pests. The exponential popularity of the mobile game Angry Birds was probably the last straw and BRA could no longer tolerate the atrocities done by these ballistic birds to demolish the dwellings of innocent swines. They trapped thousands of birds and them launched them using catapults into the sky from various locations. The aim was to spook people into giving up the game, but all they could achieve was to get a bunch of white-coats into a conference room. Well the ministry has decided to form a committee to first establish that the events of the Ramayana took place. Afterall they need the birth certificates of Rama and his engineering consolidated marks memo to prove the conquest on Lanka. Our sources also tell us that the dravidians have opposed the move and termed this as another #Amit123 money laundering scheme. Popular actor T.Rajendar has also outraged against the decision citing that the govt is always against South Indians like Narakasura and Raavana. As you know, we only bring you the news, unadulterated and un-concocted, for more on this you can tune into your daily hour of madness from India TV or even the aashta channel! That’s all for this edition of news you cannot use, this is Munna Mobile signing out. PS: Title inspired by this song. Hope to see more of these this year. I loved the way u described the characters. U must write more often …Keep them coming.